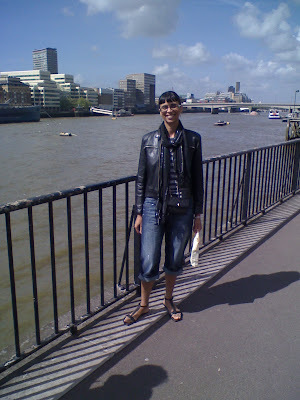 For the fashion part of this post, I'm wearing my black leather biker jacket, DSquared boyfriend style jeans and black flat gladiator sandals! 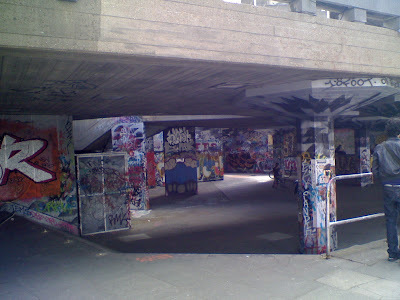 We then walked to London Bridge and crossed over to the South Bank. 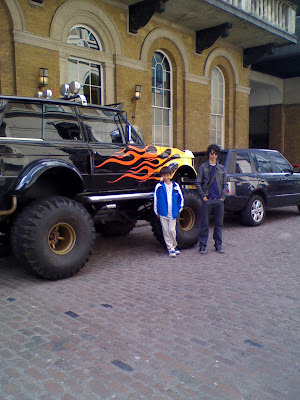 Everyone who passed this car had their photos taken by it, LOL!! Robert would have happily taken it home with him!! 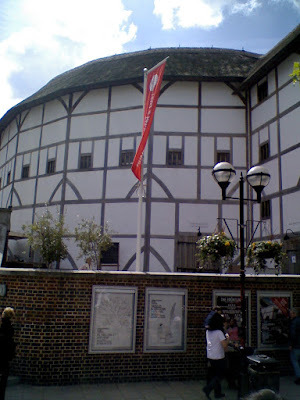 We reached the Globe Theatre-I've not been here yet, but I'm sure it must be an amazing experience to watch a play inside!! 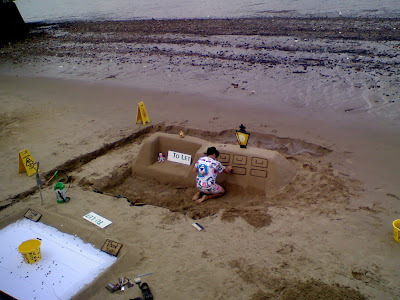 Beachside activities-who could build the best sofa competition!!! 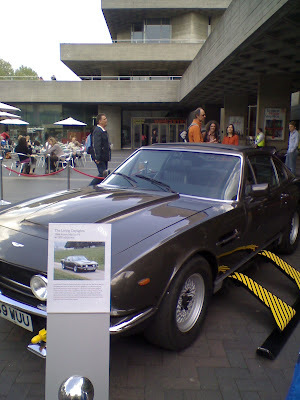 Then we came across an exhibition of the original James Bond cars, which were on display-my favourite is the white one!! Chris is so into BMXing, so we had to stop and watch everyone on their bikes doing tricks and stunts here-totally awesome!! We had stopped off at Starbucks on route and treated ourselves to a 'wild berry mocha frappachino' with whipped cream of course!! 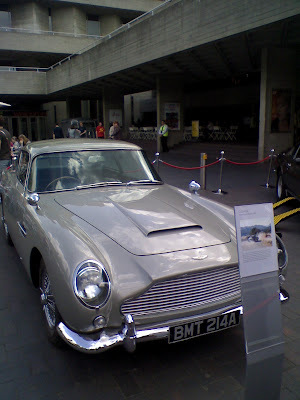 Then it was across the Golden Jubilee bridge to Leicester Square and a walk along Regents Street, where we browsed in Hamleys. Then onto Carnaby Street and a stop for a late lunch of sweet and sour chicken and rice. Thankfully, we were only a short walk to the bus stop on Oxford Street, where we got on the bus that took us all the way back home!! 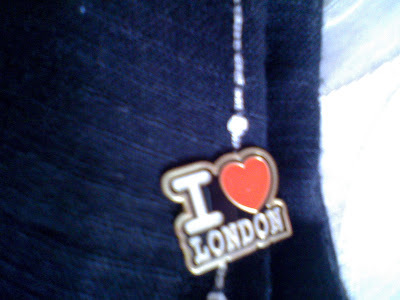 I also bought myself a small memento of the day- a 'I Love London' pin. Every time I visit, I always see something different-its so great to have such a wonderful city just a bus ride away from where I live!! Looks like a great day -- I wish I were there! What a lovely trip. I always wanted to go to the Globe. Those boys are growing so much. Love outfit. Thanks so much for the note. What a fab day, i love doing touristy things when the weathers good. Sounds you all had a great time, how cool. Thanks for the pictures, they're nice and sweet. 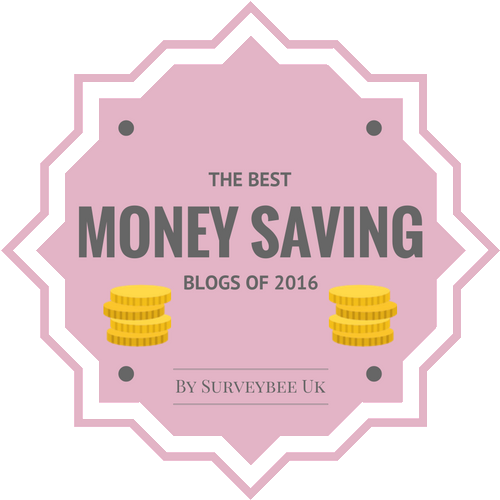 its my first time to visit your blog and i find it extremely inspirational! 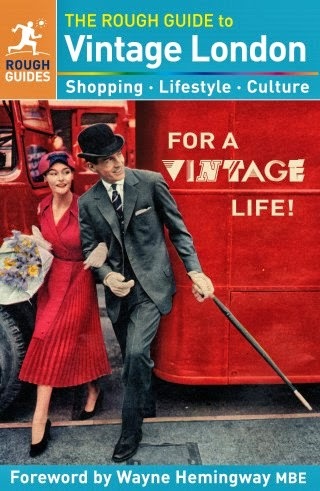 i love your thrift adventures and your features about the stuff you like. i really love it! hope to trade links with you! Fabulous photos! Love the BF jeans! 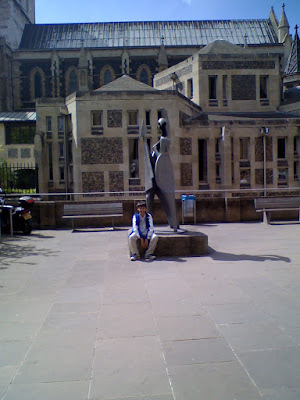 What a lovely day out, there's so much to see in London and it's lovely to wander about and take in all the sights. I was just wondering...where is that beach photo taken? i want to be there too. you look fab. 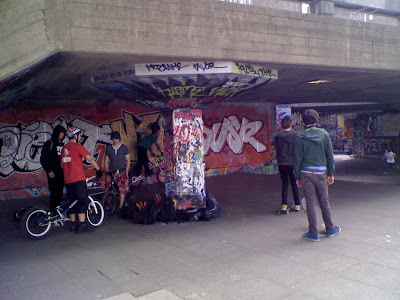 Oh I absolutely adore walking along the south bank and stopping to watch the bmx-ers and skaters under that bridge. Looks like it was a fun day out! Great day out! Your handsome boys really look like their mama too. 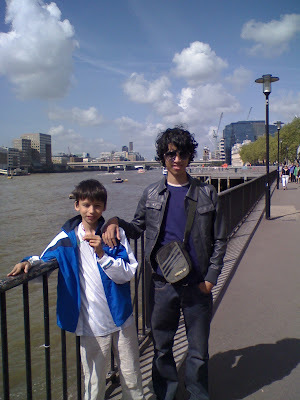 I've always wanted to go to London, It looks like you had a great time. 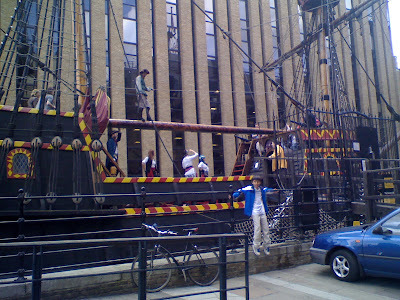 The pirate ship is awesome. 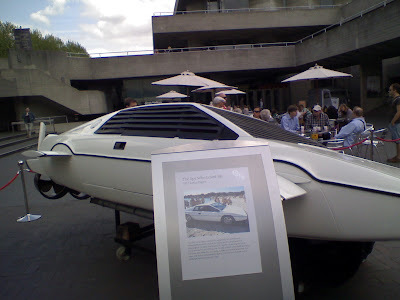 Hi there-thanks for the wonderful comments everyone and the beach is on the South Bank near the Globe Theatre! I'm sure you had a wonderful time..
beautiful photos - I am so glad you shared! Thank you so much for the note. Thank you so much for reading. I hope you are having a good week. Sharon, I don't mean to be grim, but in researching, I found recently that my ancestors (actually, the brother and sister of my ancestor) were beheaded in the tower of London. (No need to express sympathy - it was in the 1500s!) 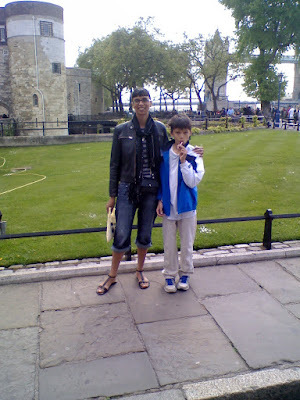 I was very glad to be able to see that and the London Bridge, since I will probably never travel there for real... I really love the travelogue by pictures. I would love to travel various places but most likely won't, so I especially love the photos that make me feel like I am there. Your sons are VERY handsome! Your outfits look great, too! Hope it is spring out there! We got some 85 degree weather and then back to cold and rain for a while... it has to get warm soon! Looks like a busy, fabulous day. Hi ambika-it was lovely, thanks!! 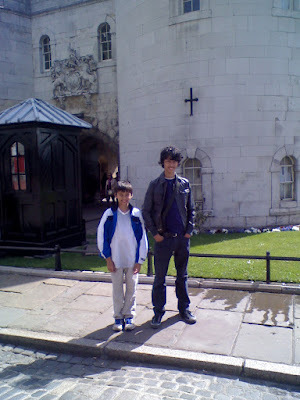 Awww this reminds me of visiting London and how beautiful it is in warm weather! Sigh. How I wish I was there. Hi Anchibride-thanks a lot my dear! Geez Sharon, even your boys are stylish! They are gorgeous kids.